The Slot Floor Monitor System (SFMS) is the most complete resource for managing customer service available today. Using it, you will be able to better meet the needs of your customers by knowing how well they are being served at any given moment. With real-time information at your fingertips, you can react to employee and player activity reports that will keep you connected no matter if you are on your casino property – or somewhere on the go. More control of your resources means more profit for your bottom line. Easily measure and analyze slot floor events to better manage response times and service bottlenecks. Powerful customer service tools that fit in the palm of your hand. Gain a competitive edge and increase customer loyalty with a desktop or wireless assistant that provides alerts for customer requests. Optimize your staff with real-time displays of your on-duty personnel. With continual updates of your employee activity, you can know who is available to help, who is en route to help a customer, who is currently helping a customer and who is on-break. Always stay connected. With a variety of informational displays available at a a glance, supervisors, hosts, floor attendants and beverage servers can instantly attend and respond to your players from anywhere on the floor. 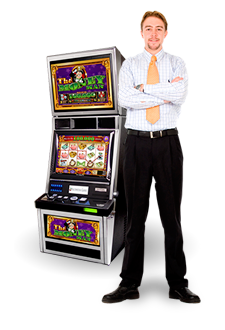 Slot Machine Work Order Generation and Management: TIMS allows configurable automated tilt criteria work order generation as well as real time manual work orders. Real Time and Archived Machine Failure Reporting: TIMS provides slot machine problem analysis by failure category, by machines with most failures and by slot machine failure history. Slot Repair Staff Activity and Productivity Reporting: TIMS provides accountability and increased visibility into slot technician activity. Return on Investment: TIMS provides potential ROI related to staffing optimization, reduction in tilt instances and player interruptions and better managed machine up-time. THE SFMS PUTS CUSTOMER SERVICE IN THE PALM OF YOUR HAND. Will you offer a Trial of the SFMS or any related module for my team to prove ROI & improved Customer Service? Yes, for each of our more than 80 locations, we have set up a 30 to 60 day Trial of the SFMS or related module(s) as locations have increased multi-departmental usage of the SFMS over time. This period allows your team and senior management to better evaluate the SFMS for its effectiveness in meeting the initiatives by department. Which floor system(s) will integrate with the SFMS? The SFMS is a “read & receive” system with data replication capabilities for IGT Advantage, ATI Oasis 360, Bally’s SDS & ACSC and Konami Synkros. We have more than 30 years’ experience in providing reliable data replication software and ten years specific to the needs of the SFMS with the various floor system vendors. Is there a difference between the PC desktop and wireless smartphone platforms of the SFMS? The differences are in the view of the information – mostly due to screen size and window by window features & functionality. One platform is designed to integrate with the other seamlessly. Since there are many locations that cannot use a wireless platform for various reasons… the SFMS is designed to offer your location as many options for efficiency of staffing and managerial oversight as you might want to utilize. With those locations that have added our Wireless module to the operational mix, they have found it to be the only option available in the market today that is intuitive and cost effective. Is there a location near my casino that I can speak with about seeing the SFMS in action? We have more than 80 locations across the US using the SFMS. Chances are good that someone you already know is a valuable member of our Customer list. Contact us to get started in setting up a presentation in person or web session so that we can share our references with you during the discussion. Now that our team has been trained on the Base SFMS, when does my trial date start, and what is the next step to get the Task Completion module scheduled? Most properties have found after the team has been trained and running a few weeks, they are ready to move forward with the Task Completion module. This usually happens before the trial date has been met. You determine when we return to train the second module of the SFMS. How many PCs are we allowed with the Floor Manager application? There is no limit to how many PCs have the Floor Manager installed. What type of device/handheld(s) can we use with the Wireless platform of the SFMS? Any device with a web browser can be used with the platform of the SFMS. What Service Time should I expect after my team is trained on the SFMS? Depending on number of games and the logistics of your casino floor, properties have seen 2.5 to 3 minutes service times once the team has been trained.